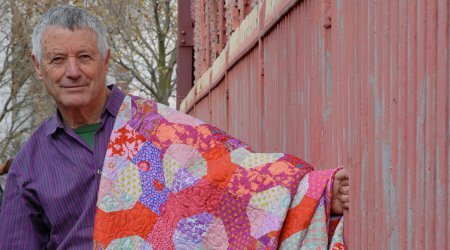 Textiles maestro, visionary of colour and one of the biggest stars in contemporary needlework Kaffe Fassett will be descending on us in a whirlwind of colour for this special event! Kaffe’s ‘Glorious Colour’ lecture will highlight pieces from his latest works from patchwork quilts, fabrics, mosaics to knitting designs and cover some of the 24 quilt shot cotton projects in Shots and Stripes. His thoughtful and intricate creations take in far-flung influences as Pakistani kanthas, suzanis from the Caucasus and Amish quilts. The designs in his new book, Shots and Stripes, are as bold and beautiful as ever, but less complex and time-consuming (so more accessible to the lay quilter). Kaffe always lights up the room with his exuberance, style and humour, and this evening will delight diehard quilters as well as crafting novices.